[Printed Document Headed ‘Van Diemen’s Land, Government House, March 17, 1821’] Signed Wm. Sorell] One of 4 items in lot 127 at the Clifford Craig sale in 1975. Current whereabouts unknown. Government and General Orders. Government House, Sydney, Saturday, February 3d, 1821 … Regulations to Be Observed in the Use of Distilleries in New South Wales and Its Dependencies. Andrew Bent, Government Printer. Foolscap broadside. Text printed in 2 columns. 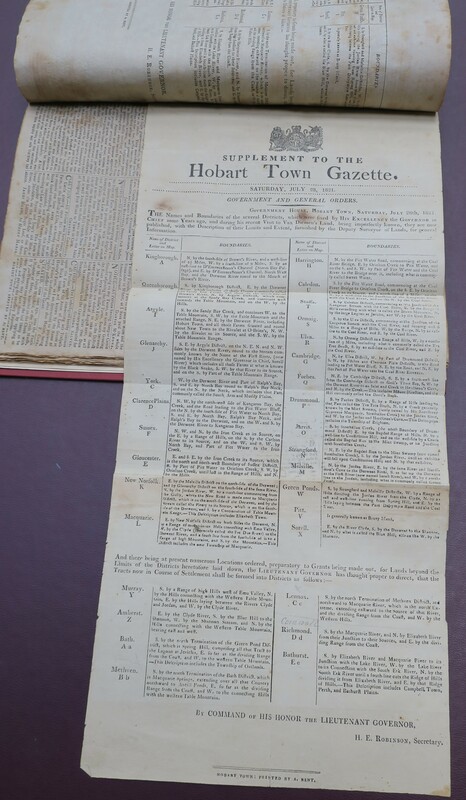 Supplement to the Hobart Town Gazette. Saturday, July 28, 1821. Government and General Orders, Government House, Hobart Town, Saturday July 28th, 1821 [listing the names and boundaries of districts as fixed by the Governor in Chief]. While these orders were printed as a regular supplement to the HTG, a larger format version was also printed. Laid paper, two pieces pasted together to make sheet 53.3 x 24.8 cm. An earlier version than Ferguson 874a. Third Report of the Auxiliary Branch Bible Society of Van Diemen’s Land. 1821. Hobart Town: Printed by Andrew Bent, Government Printer. MDCCCXXI. 24p., 16 x 10 cm. Bent had a major problem with paper supply in 1821. This tiny pamphlet, much smaller than the first and second reports, is printed on thick laid paper, quite yellow in tone. The subscribers’ names were not printed, although a newspaper advertisement on 4 Aug. 1821 suggested they would be. Regulations, respecting assigned male and female Convict Servants, as set forth in Proclamations and General Orders. Hobart Town: Printed by A. Bent, Government Printer. 1821. 18p., 18 x 14 cm. 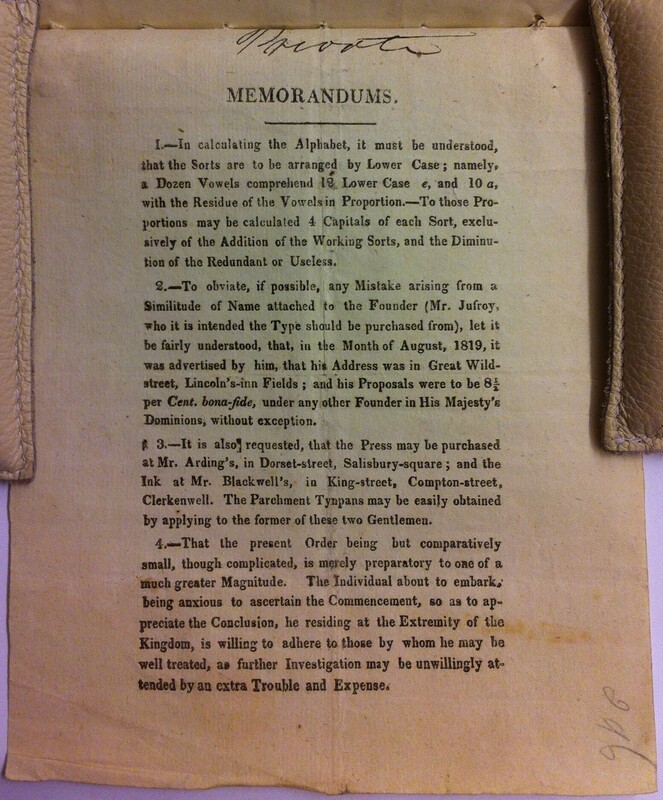 Printed on laid paper with Britannia watermark. 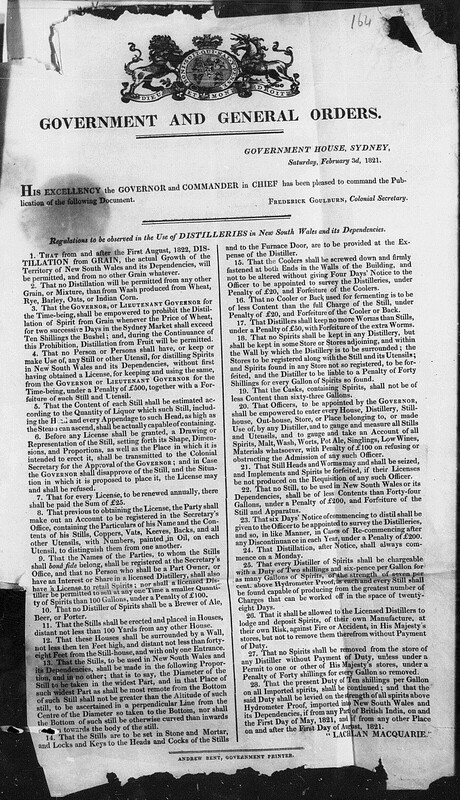 Reprints a number of pre-existing regulations still in force in 1821. 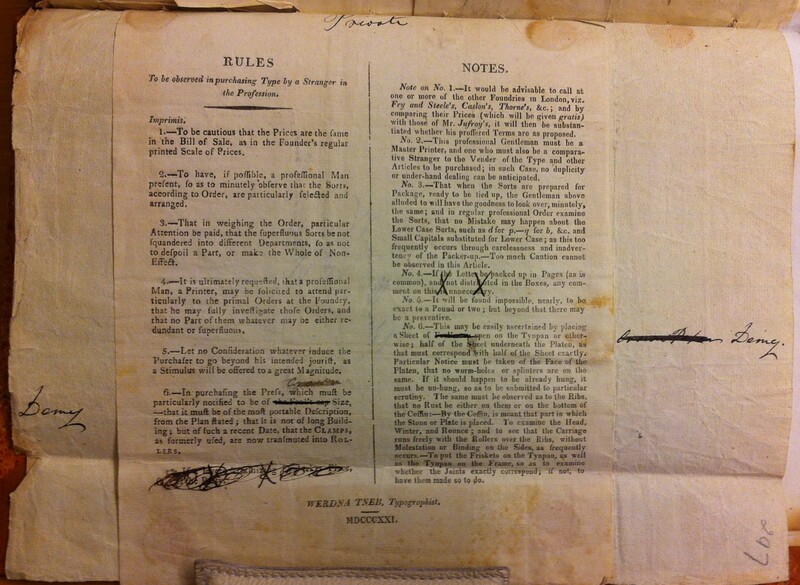 Ferguson copy in ANL belonged to John Pascoe Fawkner and bears his autograph. Ferguson 837 (Primer) and 878 (spelling book). No copies. Forthcoming publication announced in HTG 25 Aug.
SPELLING BOOK.-A small Spelling Book for the Use of Children on their first going to School, will be published at the Gazette Office on Wednesday next, Sept. 5th;-Price 2s. To be paid for on Delivery. Ferguson treats these as two separate items although they were possibly one and the same. The price was the same and the second advertisement did not mention the primer. The first report of the Wesleyan Methodist Sunday School (extracted in HTG 25 May 1822) acknowledged the receipt of 50 small colonial spelling books from Mr. Bent. Benjamin Nokes also acknowledged the receipt of 50 colonial spelling books from Mr. Bent for his Sunday School, probably the same ones. (HTG 18 Jan. 1823). Further advertisements for ‘colonial spelling books’ appeared from time to time. There appeared to be no further mention of the primer until 19 Mar. 1824 when both a colonial primer and a colonial spelling book were advertised, each priced at 1 shilling. Rules to be observed in purchasing Type by a Stranger in the Profession. WERDNA TNEB, Typographist, MDCCCXXI. Bent’s private instructions for Kermode TAHO CSO1/1/198 4725. Note the imprint. Bent’s instructions for William Kermode, commissioned to purchase a new press and type for the Gazette. Marked ‘private’. 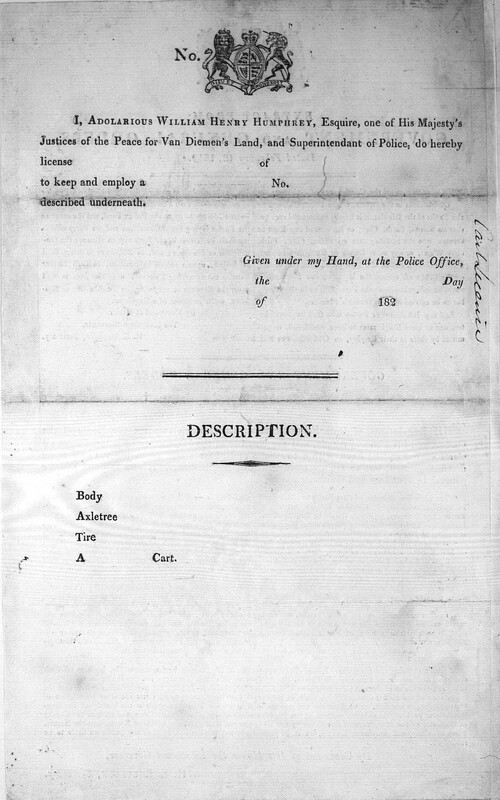 Printed paper previously used as an envelope on which is written ‘John Raine Esq Merchant Macquarie Point’ and below and to the left ‘A. Bent.’ The printed sheet is stuck onto a larger piece of paper with sealing wax. This paper also appears to be a recycled envelope as on reverse is written ‘Mr. Bell Messrs Bell & Cragg Bishops gate street.’ Several alterations in ink, which extend onto the backing sheet. 18 x 15 cm., verso blank. Further instructions for Kermode, also marked ‘private’ in pen. Requests that the type be purchased from Mr. Jufroy (Kermode appears to have actually got it from Caslons) and the press from Mr. Arding. Hints that there will be a much bigger order to come. 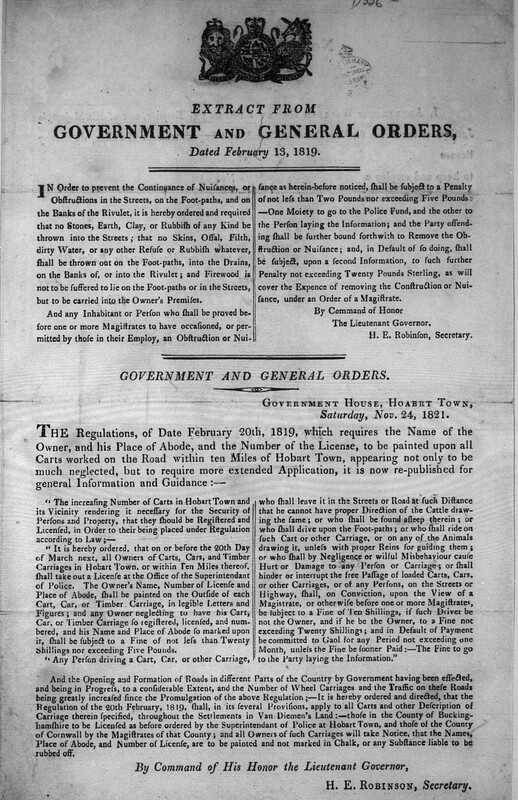 Extract from Government and General Orders, Dated February 18, 1819 … [and] Government and General Orders. Government House, Hoabrt [sic] Town, Saturday, Nov. 24, 1821. No imprint. Broadside, 32.5 x 20 cm. Cart license dated 182- on verso.